On Tuesday Ez and I had a bit of a rough day. I was not feeling myself and neither was she. Ez is on a two-week summer break from therapies and our nurse was out, so our day was spent at a much slower than usual pace. Since we’ve started Esmé’s new nighttime sleep routine she has been napping again in the afternoons–something she’d stopped almost a year ago. But mostly she falls asleep as we walk around the grocery store or in the back of the car–no longer snuggled in my arms in bed with me as she used to. Honestly I have missed that closeness. So I was thrilled on Tuesday when Ez seemed to want to curl up in my arms for a rest. And, after some silliness–which involved her laughing loudly while I tickled her, she did finally calm down and rest. She slept hard–her face resting on my shoulder, her arms limp at her sides. Her breathing was strong and steady. And her hair stuck to her sweaty forehead. Little invisible tremors ran through her limbs as she slept. It was such a pleasure to hold her like this again…to feel as if I could protect her from anything and everything. To feel the weight of our entire little world framed in the rectangle of the bed, beyond which not much else matters. I love wrapping myself up in our world–floating together in this sort of timeless space, just me and her. But while I enjoyed it, I also found myself worrying about how small her life is–how little I may be able to show her about the vastness of the world. This is fear that is both a matter of minutia–how little exposure I can offer her to peers, how little she can be left to explore places on her own. But it is more than that, I try to think about ways to give Esmé a chance to see more, to travel. 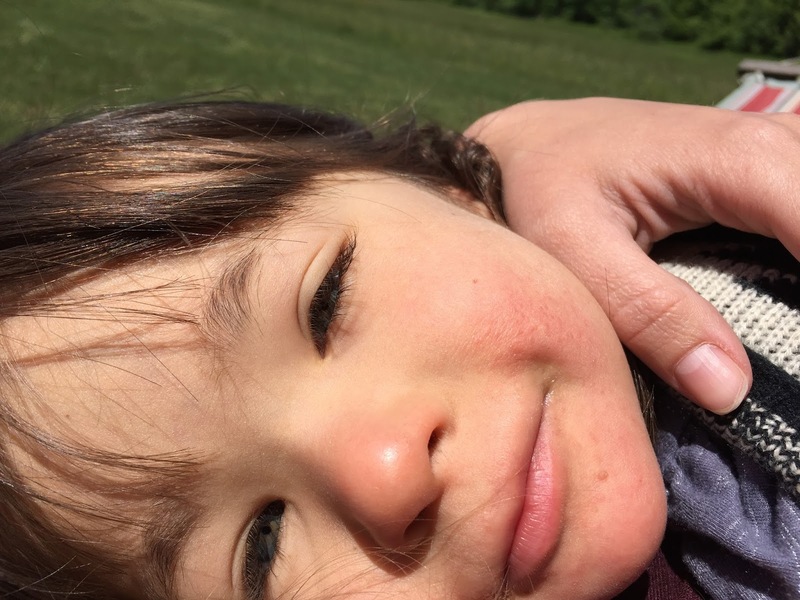 But this means spending time without nursing support, upsetting her schedule, being far from our medical team, risking setting her off…so it would need to somewhere that is really worth the trip–somewhere that would make her very happy. And I’m not sure I can figure out where that might be. What experiences does this sweet, tender, easily troubled, slightly agoraphobic, creature of habit crave? As I’ve said before, often just giving Esmé an uneventful day is the best gift of all. And so, I do recognize that some of what I am craving is probably more about my desires than about Esmé’s, but still it saddens me to think about how little she may experience of the pleasure of visiting places far away, of tasting unfamiliar food, of the freedom of exploring a new place…and it saddens me that I might not be able to experience these things with her. Sitting there with her on Tuesday, however, I also realized that, in some ways, she is a already a traveler, one of a different sort. She is helping break ground in genetics–with some of the most amazing minds in the world looking at her DNA to better understand what makes her who she is. She has reached developmental points that seemed so far beyond my hopes for her a year or two ago. She travels inward as her mind engages books, shows, and music. And her story has reached further than I ever imagined it would–something I am reminded of every time I look at the places this blog is read and see Brazil, Germany, United Arab Emirates, South Africa, Malaysia, Australia, and so on. I like to imagine what it is like where each reader is…the views, the smells, the tastes, the sounds. With each read, I think, a part of her (and a part of me) travels a bit further, beyond the boundaries of our home–of our little cozy life, and into these places in an ever-expanding world. I wonder, what each of you, might show her if you could? ← Esmé on the New York Times Parenting Blog! She would love that! I'm sure it is a fantastic thing to see them play cars! We live in NY. The east coast has so many lovely spots! Those sound like beautiful places to visit! Ezzy does love horses…so the wild horses would be especially exciting! It's not exotic but there's a lovely waterfall with a little pools to splash in near Stowe VT, so peaceful. Bonus- it's not far from the Ben & Jerry's factory. Now that's what I call a good bonus! Ice cream and waterfalls! How deep are those pools, out of curiosity? A few feet near the waterfall, but as it runs out just a foot or two, tapering to perfect for toe dipping or a little wading along the stream. I 'm sure they would get each other instantly! That sounds perfect! We will have to head out there one of these days. I would show her Lake Balaton, definitely! And she could look at the animals in the zoo on Margaret Island in Budapest. 🙂 Or in the proper, big zoo, my sons love it. Lots of positive thoughts sent to you from Hungary! You are true inspiration for everyone. Thank you! These sound like beautiful places to visit! What is Lake Balaton like? I've never been lucky enough to visit Hungary. I would show her Red Rock, Valley of Fire, and Mt. Charleston along with the Rio, the Harrah's hotel (with its anti griddle ice cream), the Bellagio's water fountains, and so many other things. I live in the state of a thousand thrills. Oh I bet she would like that!! Oh wow! Those sound like amazing things to visit! I bet she'd really like the anti griddle ice cream! What flavor do you like best? Brownie is the superior flavor. Hello Marisa! So you are one of our African readers! Thank you so much for your comment! We are read in Nambia, South Africa, Cameroon (where my brother Baba is from) and Morocco. It was so exciting when I saw readership appear in Africa. It made me feel as though Ezzy was traveling there in her own way. I know she'd love to see the beautiful sights and amazing animals where you are. (I would too!) Id love Ezzy to meet your daughter! Would she like to see anything special from where we live? What about the beautiful colors the trees change to in the northeastern US?